New York City design company, Souda, is quickly developing a beautiful, innovative collection of modern home accessories. By enlisting the help of a growing assortment of young designers from all over the globe, Souda’s new home decor releases for this year’s NY Now and ICFF (International Contemporary Furniture Fair) are already making waves. The often neglected, last-minute addition of home decor to any designed space will no longer be an afterthought with Souda’s contemporary, curated collection. Only three years since its inaugural collection, Brooklyn-based design brand, Souda, are channeling efforts into the development of a rich, eclectic, and modern home accessories line. The often neglected, last-minute addition of home decor to any designed space will no longer be an afterthought with Souda’s contemporary, curated collection. Enlisting an ever-growing roster of young designers from Detroit to London, Montreal to Frankfurt, Souda is producing an array of objects suitable for both residential and business interiors. Highlights of the collection include the Wave Business Card Holder, designed and developed by Nina Cho. Inspired by her Korean heritage and the Eastern principles of ‘white space’ and the ‘aesthetics of emptiness’, this statement-object - available in either copper or brass - is the ideal finishing-touch to any office space. Another recent introduction, the Sass Pedestals designed by MPGMB, take their form and material sources from the master of fusion and play, and precursor to the Memphis Movement, Ettore Sottsass. 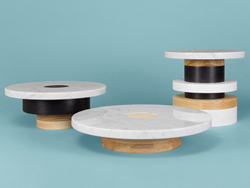 With a range of sizes, available either as a set or presented individually, the marble and wood pedestals elevate ones prized possessions to new heights. The Wave Business Card Holder and Sass Pedestals are just two of a number of products that Souda has released in the past few months. Other designs include the futuristic Disco Bottle Opener, available in copper, brass and silver, designed by Loris & Livia; the Pen Brick pen holder by DDQ; and the Pi Mirror, a cantilevered circular table mirror on a marble pedestal by Kai Linke. All of these designs can be viewed on Souda’s website. Souda’s home accessories collection beautifully compliments their growing array of modern furniture and lighting. With a number of new releases planned for the upcoming year, Souda’s decorative accessories line is certainly something to get excited about.